Best suited to clean narrow alleys or when manure dries fast. Can be adapted to clean an alley that varies in width. Available with floor mounted or groove guided draw bar. Adapted for alleys between 73" to 174" in width. Available with steel blades or flexible urethane blades that can be adjusted to compensate wear. Several draw bar accessories available for concrete alley, rubber flooring and sand bedding. V-Shape bidirectional scraper is designed for a free stall barn having a cross gutter in the center and one scraper per alley. Clean and dry slats contribute to a better hygiene and reduction of the claw problems. It is hard to imagine that many dairy farms wouldn't have a slat scraper. Removing the manure from the slats has become more difficult, because the manure is much drier due to change of feed and well ventilated Barns. We offer a broad range of manure scrapers. Power and simplicity for 285-foot (87 m) maximum scraped alley length and 900-foot maximum circuit with four scrapers. One horsepower electric motor drives a worm gear speed reducer and heavy No. 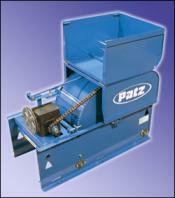 80 roller chain to turn the 29.5-inch-diameter (749 mm) drum with 18-inch width. Includes reversing switch plus cable overwrap switch for protection. A switch also prevents the motor from starting when the guard is raised. All external grease fittings for convenience. Planetary Speed Reducer (Highly efficient requiring lower horsepower, resulting in lower electrical usage.) #80 Roller Chain Drive. 27-1/2" Diameter Drive Drum - 18-1/2" Wide. 2" Replaceable Drive Drum Shaft. Unique Roller Chain Tightener - Easy Adjustment. All external grease fittings for convenience. 1/2 HP Motor Drive for 2 Scraper System. 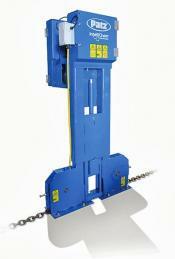 3/4 HP Motor Drive for 4 to 6 Scraper System. 1 Reversing Switch and 2 Over Wrap Switches for Protection. #80 Roller Chain Drive. 56" Diameter Drive Drum - 18-1/2" Wide. 2" Replaceable Drive Drum Shaft. Unique Roller Chain Tightener - Easy Adjustment. Up to 2,280 foot in length. The IntelliChain™ Alley Scrapers are powered by our UL/cUL certified SmartSense™ MasterMind Control Panel. Featuring the innovative Patz "Learning System", which constantly adjusts to weather, bedding, and manure changes, the MasterMind Control Panel continually recalculates the amount of torque needed to pull to the drop point. Our top-of-the-line safety features include enhanced sensitivity in detecting obstructions within the alley. Furthermore, the glove-friendly, easy to use touchscreen display allows users operate the IntelliChain™ Alley Scraper with the push of a button!